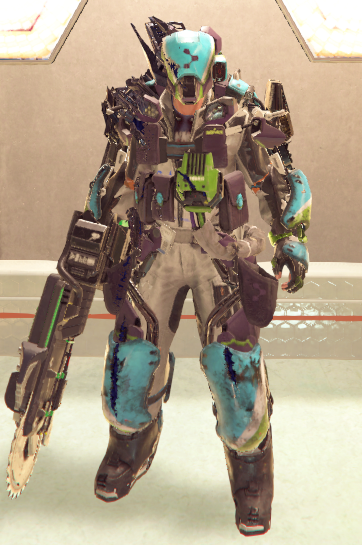 MANTIS Gear is a DLC Gear Set in The Surge. "MANTIS gear is an all-purpose maintenance platform, available to operators and technicians after completing the necessary training certifications. An in-helmet AR display overlays virtual schematics onto real machinery, making diagnosing and repairing high-tech faults more efficient than ever before! As a result, CREO has begun worldwide trials, offering MANTIS to manufacturers in other industries - clients need only upload their schematics to the CREOnet Cloud Service (CCS), and they'll be ready to go in minutes." "Wearing a full set of MANTIS gear reduces all injectable energy costs by 25%." Drop from MANTIS Zombies in the upper CREO World. Average defence and low power core cost for Sentinal class. The set bonus in combination with the Medi-Voltaic Injection implant can improve survivability in low energy situations. So, is it SUPPOSED to look like the [REDACTED] partially converted parts of it? A very easy set to complete, and quite strong for energy builds that use the v1 or v3 medi-voltaic implant and drone attacks. You can obtain this gear quite quickly in a new game, which makes it, like the Scarab, a very nice gear set for rolling the early game. that inject able discount is VERY powerful with a v3 medi-voltaic injector,and it has acceptable defence!